Atlanta Journal-Constitution, "Demand for Walkable Communities Unmet," Jan. 19, 2007: "A report scheduled to be released in conjunction with a panel discussion of Georgia planners and health experts has expanded findings on the benefits of pedestrian-friendly neighborhoods...[the study says] there is a significant, unmet demand for developments that make it easier to walk from place to place." As editor of the Planning Commissioners Journal ("PCJ"), I try to keep up with news on what's happening around the country, and what topics planners are dealing with. The Atlanta Journal-Constitution article cited above is typical of what we're seeing nationwide: a rapidly growing interest in "walkable communities." A confluence of trends seems to be behind this. For one, there's been growing interest in the health implications of sprawl. From a relatively limited concern, this has exploded into coverage in major national publications and has led to a growing body of research. In the same issue of the JAPA, there's also an article Many Pathways from Land Use to Health [pdf file], examining the link between walkability and air quality. The researchers asked if more walkable environments led to reduced auto use, and, in turn, better air quality. Using a "walkability index" that factored in things like net residential density and street connectivity, they found that more walkable neighborhoods yield at least some improvements in air quality (also pointing out that "greater improvements in walkability should lead to larger effects"). Consider also the rapidly growing "safe routes to school" movement, which seeks to get more kids walking to school -- in large part for the health benefits, but also as a way of promoting neighborhood schools in places where walking to school is still possible (we've reported on "school sprawl" in the PCJ, and know that in many places walking to school is simply an impossibility). Advocating for the opposite end of the age spectrum, AARP has started a major "livable communities" initiative. In Burlington, Vermont, one of the pilot communities in this project, seniors have taken neighborhood walks, where they've evaluated the condition of sidewalks, crosswalks, and signal timing -- with the aim of enabling more seniors to be able to walk from where they live to nearby stores and community services. Cities where you wouldn't expect it are also focusing on pedestrians. In Kansas City, Missouri, one of the nation's most auto-oriented places, the City has adopted a Walkability Plan, with innovative strategies for promoting more walkable neighborhoods. Kansas City now requires neighborhood walkability audits as a prerequisite to receipt of certain capital improvement funds. The city's development review process also takes into account not just traffic, but pedestrian impacts. PCJ offers a summary of what Kansas City is up to. [pdf file]. 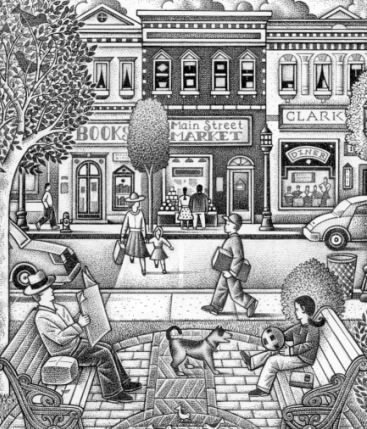 Here's one more force behind the interest in walkable communities: the New Urbanism movement. Those of you familiar with New Urbanism -- which has taken off as an approach to urban design and planning in recent years -- know that it has as a core value a commitment to developing walkable communities. Consider just two of the guiding principles in the Charterof the Congress of the New Urbanism (new urbanism's guiding body). Also connected to the heightened interest in walkable communities is the voice of hundreds of Main Street organizations and downtown business groups. They are seeing how their efforts tie in nicely to promoting walkability. And, of course, there are few places more conducive to walking than downtown main streets. But even in newer suburbs, town center developments are proliferating -- and are being promoted in terms of their walkability, not just their auto accessibility. "One of the keys to regional and local prosperity is the ability to attract and retain high-skilled people. ... Many people can, and do, choose where they want to live based on factors beyond their ability to make a living. "Quality of life" has become the coin of the realm. The economic value of a community's attractiveness as a place to live, work, and play is becoming widely recognized by business leaders, local officials, and planners. This has led many cities to focus on ... a built environment that encourages a vibrant street life -- elements that require a welcoming, walkable environment for people of all ages." Twaddell goes on to note, "Walkability isn't just for cities and suburbs. The economic health and livability of small towns and villages depends upon it, too. Participants in surveys and focus groups conducted for a recent national study on integrating land use and transportation in rural communities repeatedly emphasized the need to invest in sidewalks, crossings, and street amenities in order to take advantage of the compact, connected design they already enjoy." And before I close, it's interesting to note that even the National Highway Traffic Safety Administration is promoting walkability, witness its Partnership for a Walkable America. As the NHTSA puts it, "Our nation has simply become 'unwalkable' despite the fact that everyone is a pedestrian!" The NHTSA's objectives: "to make walking in America safer by reducing motor vehicle-related deaths and injuries; to provide information about how to achieve walkable communities; and to encourage walking as one of the easiest ways for Americans to improve their health and lower health care costs." So what's the bottom line? It seems that walkability is in. It's hard to argue with benefits that range from health, to air quality, to quality of life, to economic value, to safety (and I probably left something out!). What we seem to be witnessing, dare I say, is a walkability movement. But I'm curious to hear your take on this. Is walkability of growing importance in your city or town? And, if so, what do you think is behind the interest? Wayne Senville is publisher and editor of the Planning Commissioners Journal (since founding the PCJ in 1991). He served as a member of the Burlington, Vermont, Planning Commission from 1990-1999, including three years' service as Chair. Senville was also honored by the Northern New England Chapter of the American Planning Association, and the Vermont Planners Association, as Citizen Planner of the Year in 1999. Between 1988 and 1991, Senville was Director of Local & Regional Planning Assistance for the Vermont Dept. of Housing & Community Affairs. Resource: A great resource for anyone interested in this topic is the Walkable Communities web site, put together by Dan Burden.